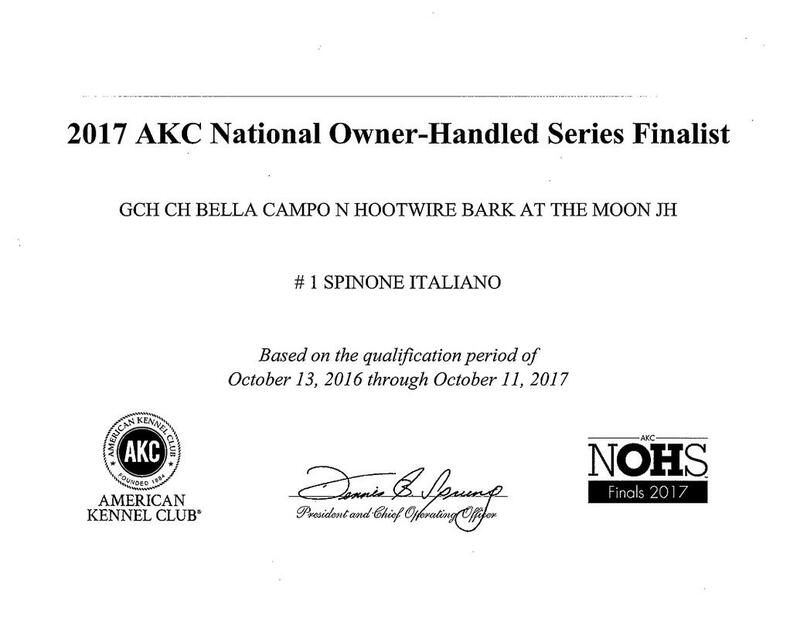 2018 is starting out quite nice for Zoli and myself in the Owner Handler ring, picking up two placements OH G1 and OH G2 and making the short list in the regular sporting group on Sat Feb 10th. This boy is a joy to show and makes me so proud that he does seem to be filling in his dads paws. AKC Owner Handled Series for 2017 is now over, we are so proud of our boy Zoli finishing in the #1 spot with a grand total of 500 pts. Many memorable accomplishments for us this year, Zoli truly is a special boy whom I enjoy showing. 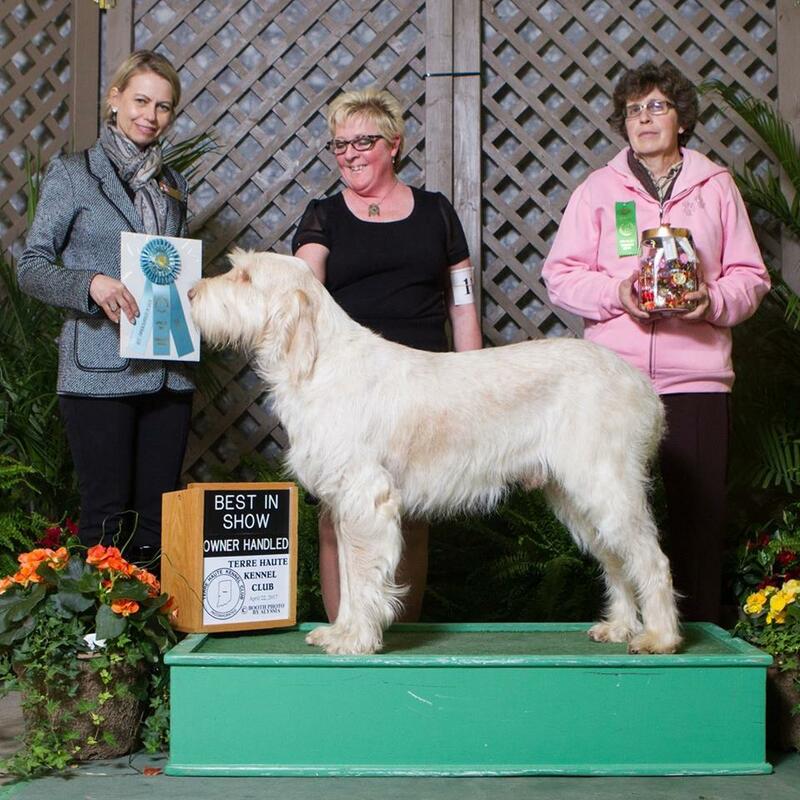 So what an amazing weekend in Monroe, 40+ Spinone entered what a fantastic turnout. Zoli showed his heart out all weekend and placed in the ribbons 3 out of 4 days. 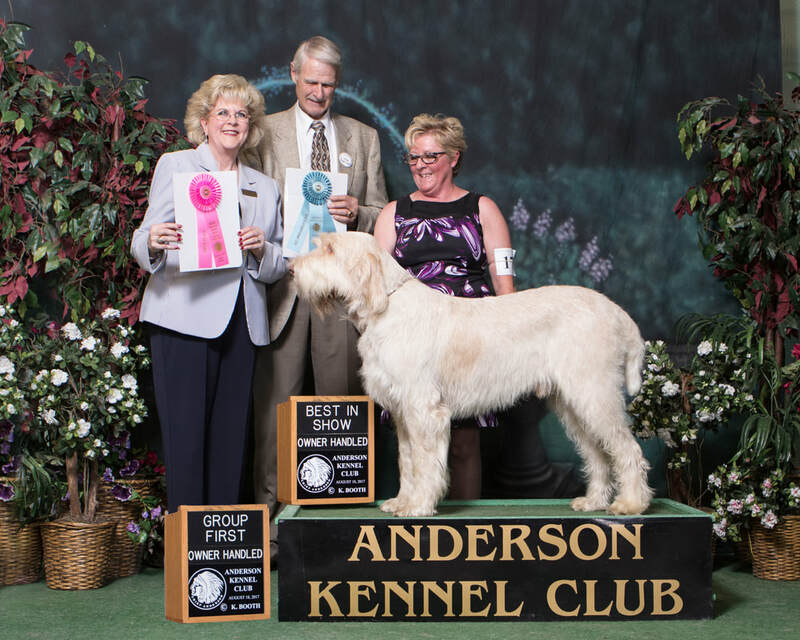 Friday July 7th started out with Michigan Sporting Dog Association going Best of Opposite, on the second show SCOA Speciality Show Select dog, moving on to Saturday all breed show, Best of Breed, Owner Handler, and Owner Handler Group 1. So proud of Zoli at 3 1/2 yrs. old. Well another proud moment for Zoli and I, on April 22 at the Terre Haute KC Zoli earned our first BIS Owner/Handler. Awesome weekend total in all was BIS, G1, G2, G3 & G4. It was a ruff start to 2016, which started with me braking my ankle on Jan 12 that required surgery so up until now it's been a slow healing process. I hope to be able to finally start showing Zoli in the very near future. 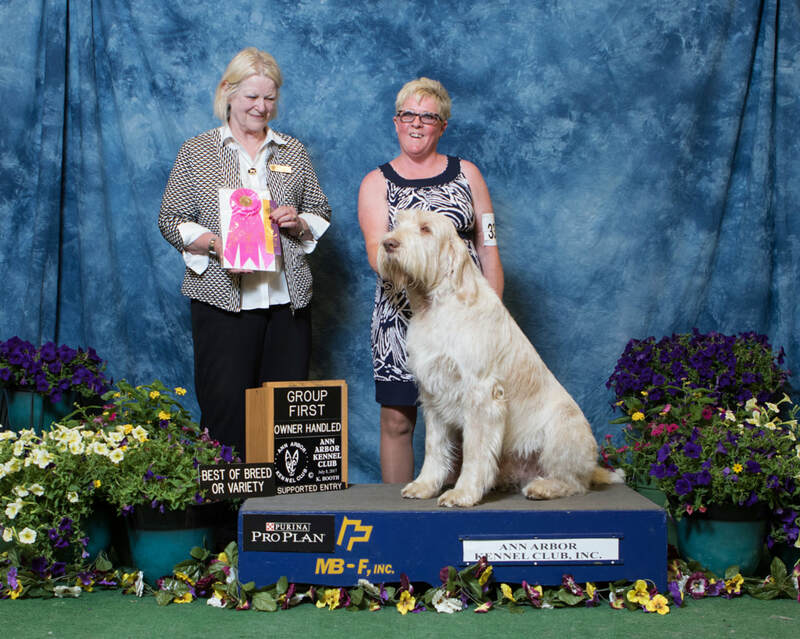 We recently attended the Monroe, MI dog show in July with a wonderful entry of over 30 Spinoni. This was a supported entry by regional club Blue Water Spinone Association and SCOA parent club. It was a well attended by Spinoni enthusiasts from all parts of the country. 4 days of shows, sadly I was not quite ready to show so I had a wonderful friend filling in for me, I met Dave Daugherty years ago when I was very green to show dogs world. 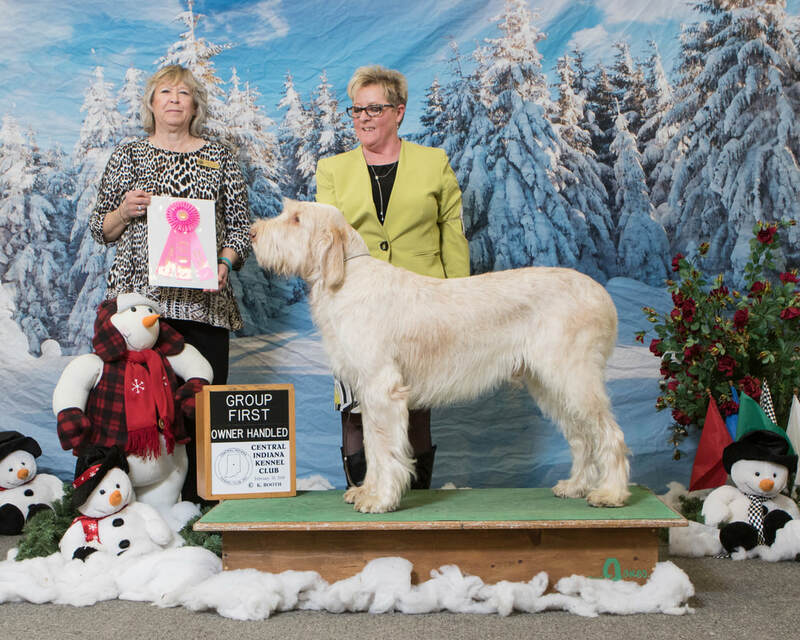 Out of the four days Zoli made the final cut in special dog 2 out of 3 days and in the ribbons on day 4 taking Select Dog on Sunday. I'm very proud of my still young boy who is maturing nicely. Pia had another wonderful time hunting last night. She is one amazing girl that hunts with all heart. 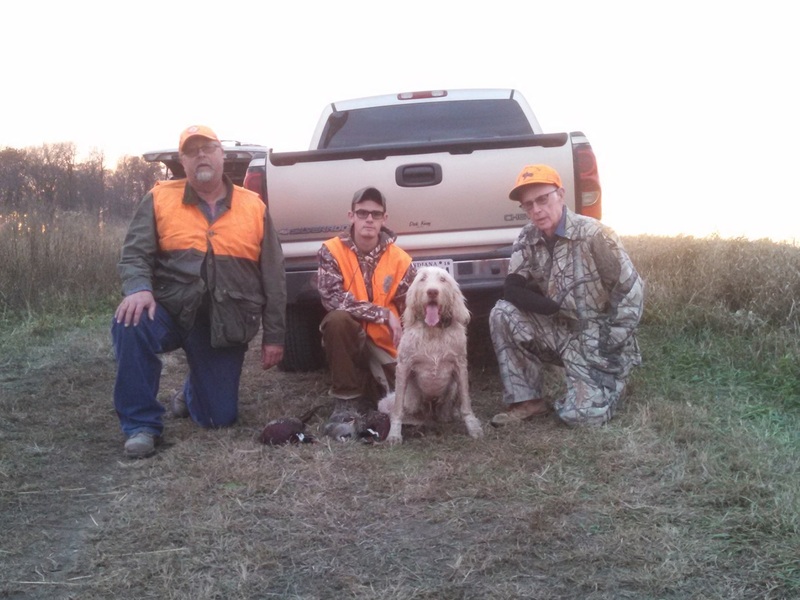 It was such a fun time to be hunting with my dad who is 83, my nephew 16, and Mike 54. My dad has hunted his entire live, and loved bird hunting, but had not been in a very long time mainly due to lack of birds, well and possibly age :-) He has never hunted under a Spinone, so it was extra special for me to see him hunting under a dog we bred. Dad got an added bonus he shot his first chucker. I should also mention not only being 83 but my dad only has one hand. He has accomplished so many things over his 83 years of age and hunting is defiantly one of them. Hats off to my nephew Will and hubby on their awesome job of bagging a bird. Well ok, a few got away but that's hunting….I cannot wait to go hunting again with these guys.